Are Custom Mezzanines a Good Investment? Real estate is one of the most important assets your business has. Having the right building helps determine how productive you can be. It helps to alleviate the stress of not having enough space. Real estate is much more than a business asset. It is an investment that helps you now and can be sold off later. One way to increase the value you are getting from your building is to improve the space you have the best you can. 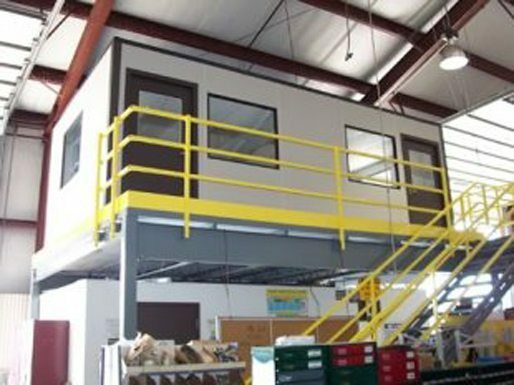 Modular mezzanines are a great investment because they help you take advantage of the vertical space within your building. Mezzanines help you get the space you need without having to expand your property. With the right mezzanines, you can improve the value of your property and save money on your next expansion. Most of the mezzanines you find for sale online will be prefabricated. This means that they are constructed off property and then delivered to you. This helps you eliminate downtime in the workplace and allows you to avoid the hassles of construction. Instead, you will be able to simply choose one of the many prefabricated mezzanines designs, order and wait for arrival. It’s that easy. Panel Built mezzanines are a great choice for any growing business. Made from durable materials that last for years, these modular mezzanines help you save money over time. They are a low cost solution that many businesses rely on. If you are looking for office mezzanines, no matter what size, visit our website. We have several examples of previous work that can inspire your future designs. Our mezzanines are built to look appealing and be highly functional. If you don’t find what you are looking for in our online examples, speak to a representative about getting a custom design. Some business owners are weary of investing in a custom mezzanine design right away. Unlike other prefabricated steel mezzanines, custom designs are tailored to your business. This means that you can get any style or shape you need to run your company. The sky is truly the limit when it comes to structural mezzanines. You can add any combination of open spaces and rooms. Each area of the mezzanine is modular, so you can move it around as your needs change. You could even resell part of your custom design if you no longer need it. When considering cold-rolled mezzanines available online, remember that placement is the key to productivity. Don’t feel the need to restrict yourself to a mezzanine that leans against a wall. Free standing mezzanines are becoming more common on jobsites and can be significantly easier to move later on. Best of all, your cheap Panel Built mezzanines online can be easily modified to match your building’s design. This allows you to get a cheap structure without making your building look tacky. Instead, you can choose from several different metals, colors, windows, doors and other features. By working with a company like Panel Built, you can get the fully customized design you need to look professional. When deciding if steel mezzanines are the right choice for your company, price is one of the first things you will consider. The mezzanines price is directly reflected in the features you choose. This helps you to save money investing in only what you need. Working with an experienced company that sells prefabricated steel mezzanines can help you get the space you need even cheaper. An experienced company will point out new ways to save money. Sometimes a simple design change can save you thousands of dollars. Because each of the cold-rolled mezzanines are made to order, it is important to work with a company on a personal level. There are several companies that sell steel mezzanines online to choose from. Find a company like Panel Built that does the bulk of its business online. The company can then pass their savings on to you, helping you get an even lower price on your prefabricated steel mezzanines. Panel Built is a popular company to work with when it comes to getting custom built mezzanines. We are known for having some of the best modular mezzanines available at affordable prices. Our goal is to help you get a practical solution to your space problem at a fraction of the price. With our help, you can get something more than a cheap building expansion. One thing that makes mezzanines by Panel Built stand out is the professional quality. Many of our customers operate warehouses and factories that see a lot of traffic. That means that every mezzanine we build needs to be able to withstand heavy use. Because we have years of experience, we know what areas to reinforce and how to treat each metal piece. If you are wondering where to find custom mezzanines online, look no further than Panel Built. Contact us today to learn more!